By Victor Balasa in Social Media. Updated on February 9, 2018 . If you’re an Internet gadabout, you’ll probably have heard about Tsu.co or Tsū, the social network that’s been getting a lot of hype, and hate, lately. Throughout its year-long existence, the social network exotically called Tsū has been plagued by naysayers and, just recently, had its API and links banned from Facebook. Considering that, until as recently as this week, it’s been an invite-only network whose content/posts couldn’t be accessed by crawlers, spiders, scrapers etc., the now month-long ban is presumably taking a toll on users who’ve been cross-promoting their Tsū content on Facebook for increased reach. Zuck’s mammoth network is claiming Tsū users have been trying to rig the system, by creating fake accounts to promote their posts and consequently boost their revenue on Tsū (more on that below). Sebastian Sobczak (who co-founded Tsū with Drew Ginsburg) and artists who’ve been hit by the ban purport this is just a heavy-handed maneuver meant to weaken a competitor that’s gaining ground. As such, Tsū has now opened its gates to everyone (not that it was that hard to get in before). But what is it about Tsū that’s rubbing Facebook the wrong way? 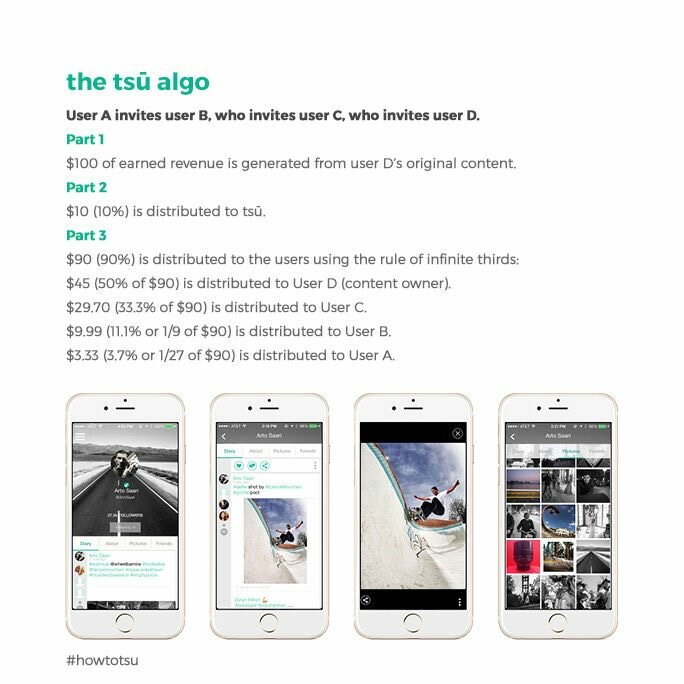 With 4.5 million users to date, there’s still no chance Tsū is going to be a household name, like the billion-strong Facebook, anytime soon. Still, more and more artists and early adopters are jumping on board, largely as a direct result of the perceived rebellious premise of Tsū. The anti-Facebook rhetoric it’s been employing to attract users over from Facebook seems to be paying off, thanks to their promise to let users keep 90% of the ad revenue on the site. And users have been quick to answer the clarion call, lining up as a result of what they perceive as their right to monetize their own content. With Tsū clamping down of late on users posting third-party content, the revenue stream seems particularly tailored for creators and artistic types. But that’s not to say Tsū feels in any way exclusive, like the other anti-Facebook network making some waves not long ago with its no-ads promise to users, might seem at first sight. Ello might have fizzled out of the news cycle, but it’s remained a purveyor of "beauty, " making a buck from T-shirts and paraphernalia made from its users’ art (just like VSCO is doing now with its new Artifact Uprising app). Tsū however lies at the other business-centric end of the underdog SNS spectrum: it doesn’t push any lofty or artsy proposition, but stays defiantly grounded in pragmatism. Help me help you make us all some money! Revenue from ads is what sustains most publishers these days, although the trend of ad blockers aiming to change that in the name of users’ on-site experience is growing fast. Social media sites aren’t of course exempt unless they’re expressly whitelisted by users. Still, while there is money to be gained from traditional ad practices, you can bet everyone from Facebook to WordPress will be engaging in them to the bitter end. But Tsū is only cashing 10% of what advertisers send their way, with users getting paid 45% in "royalties " on any original content they create and the rest being divided among their "family tree, " i.e. the "parents " who invited them into the network. The deal you strike with Tsū and its Monetization Service will get you a trickle of money or a truckload, depending on your follower and "children " counts, and how many shares your posts and your invitees’ get – since more views on a post equal more impressions and clicks on ads. But veteran Tsū users will be the first to warn you that the check will be slow to arrive, as the first few months are all about building your network by posting original, properly hashtagged and user-tagged content and (full-sentence, value-adding) comments. The latter won’t earn you royalties, but, as is the case with most social networks, it will get your profile seen and, presumably, get you more followers. From what I could gather over the course of a few weeks on Tsū (under an alias), the features and functionalities are pretty much in line with what you’d expect if you’ve ever used Facebook. And the invite-only gateway (that Tsū seems to have dropped as of late) was there mostly for the cachet and the added bonus that any "invited " user would automatically become a money-maker for his/her "parent. " If you, like me, didn’t know anyone who’s on Tsū, all you needed to do was Google "Tsū invite code " or something to that effect, and you’d find plenty of sites listing existing users whose personal short code you could then use to enter. So what happens after you join Tsū? You start by populating your profile with the regular stuff (photo, bio, other social accounts) and discovering other users (aka #Tsūalites) you can follow, through the Popular tab. You can also join a TsūGroup, a new feature currently in Beta and numbering all of seven groups, the most popular one, with almost 32,000 members, being TsūCharities. The question on everyone’s mind when they hear about this attractive (too good to be true) revenue model is, or should be, what’s the catch? And many detractors have been pretty vocal in their concerns over Tsū being nothing more than a MLM (multi-level marketing) scheme. On the face of it, the accusation fits the bill pretty well. So, let me try to clear that up. As far as your digital Tsū wallet goes, the terms and conditions are pretty self-explanatory: on joining, you enter into a contract of sorts with Evacuation Complete, the company operating Tsū, that allows you, whoever invited you (if applicable) and whoever you invite to earn money from ads running on Tsū. The proprietary algorithm used to divvy up the sums is defined in the TOC as "the rule of infinite thirds " (don’t worry about keeping up with all the specific jargon, thinking too hard about Tsū defeats the purpose anyway). That algorithm runs whenever Tsū disposes and tops up your wallet accordingly – you won’t be eligible to cash out though, until your account (under your "Bank " tab) reaches at least $100. There are a bunch of advertisers working with Tsū – that well won’t dry up anytime soon – and the network has recently managed to skirt Apple’s ban on pay-for-install practices from apps, so on its mobile version, you can see Twitter, Lyft or other bigwigs shooting you up for installs. Clicking through to install the apps advertised means more ad revenue for you, so there’s a nifty circularity to the money trail. There’s nothing to lose, not for advertisers as long as Tsū’s user base keeps growing, and certainly not for Tsūalites. So, Tsū can shoot down the MLM charge by pointing at advertisers as the only ones injecting any money into this whole affair – and that, like the Apple ban trick, is both defensible and suspicious, like any loophole ever exploited. To sum up, while the above-mentioned loopholes may narrowly save Tsū from being deemed illegal, there’s a shadiness factor attached by society to these kinds of practices that rubs some people the wrong way. On the other, practical, side, there’s no doubt Tsū’s pay scheme helps some artists survive and even thrive, while putting a premium on original content can only add value in a digital world suffering from an influx of copyright infringements, that for the most part go unchecked, and a shortage of content. I didn’t care for Tsū for a couple of reasons, though, which may or may not be just me being overly sensitive to these kinds of things. There’s a tangible aura of hypocrisy to it, for one: while the site, and Tsūalites, sing the praises of a nice-sounding ultimate goal, that is, working towards building a community, the lay of the ground feels a whole lot more pragmatic than all that. Everything , to the #TsūTips for "expediting follower growth, " feels sharply focused on one thing only: priming the pump, getting paid. And, while there’s nothing wrong in a (presumably starving) artist wanting to get paid for his/her art, most of the content I’ve seen posted on Tsū is really stretching the notion of "art ". I don’t mean to offend anyone on Tsū, but from what I could see, the majority of Tsūalites are non-artist types whose idea of original, valuable content is shooting a stickered photo into the interwebs and hoping it soars far enough for a quick payday. The written (more or less) rules of posting: 45 times a day, tops, including no more than 15 shares that you can avail yourself of or not; and other caps: 50 pending friend requests at any given time and a maximum of 1000 people you follow; also cheapen the would-be "networking " ethos, in my opinion. The rulebook feels like a top-down laying of the law in a space that would implode without all the policing. The all around vibe I got from the community is obsequious, as everyone is too busy making nice with everyone else for the sake of ultimately gaining more followers, more views, more shares, more impressions and, yes, more dough. I may be reading the "room " wrong, or just more confrontational than most, but at some point, you have to ask yourself, how many different, eloquent, multi-word ways are there for saying thanks for a post?